How to Use a pH Test Meter? 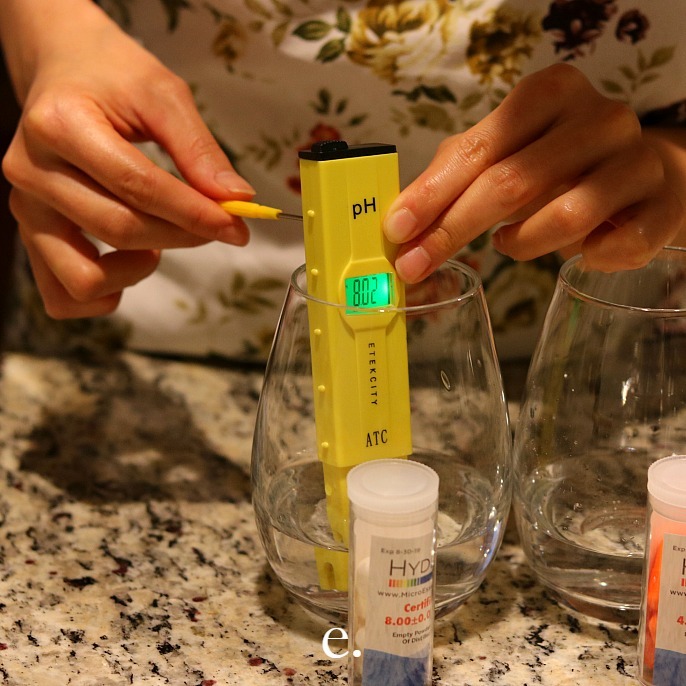 If you just got your brand-new pH test mete, the chance is that it is not calibrated. A pH test meter will need to be calibrated before you use it for any experiment to maximize the accuracy of the results. I ordered my pH test meter from Amazon. It came with two packets of the pH buffer powder for calibrating the pH test meter: one for making a solution with its pH being 6.86 at the room temperature of 77 °F (25 °C); and the other one, 4.00 at the room temperature of 77 °F (25 °C). Considering I may calibrate my meter on a regular basis in the future, I later ordered more pH buffer powder in capsules- the buffer powder 4.00 and the buffer power 8.00 - from Micro Essentials Laboratory. These capsules of powder are specifically made for quick and easy pH meter calibration. One type of the powder will produce a solution at pH 4.00 at the room temperature of of 77 °F (25 °C); and the other, a solution at pH 8.00 at the same room temperature. The following example demonstrates how I calibrate my pH test meter by using these two kinds of powder I ordered from Micro Essential Lab. 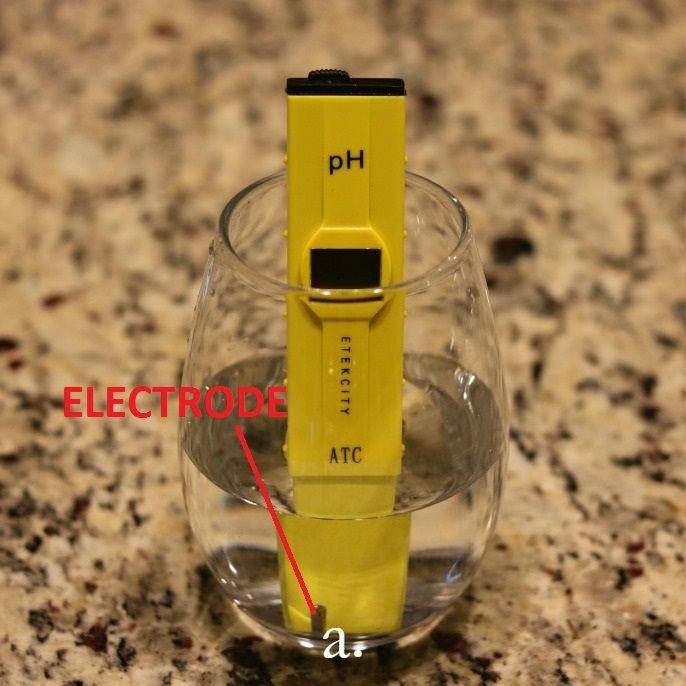 If the electrode is dry, submerge it in the distilled water for 10 minutes before calibration (a). 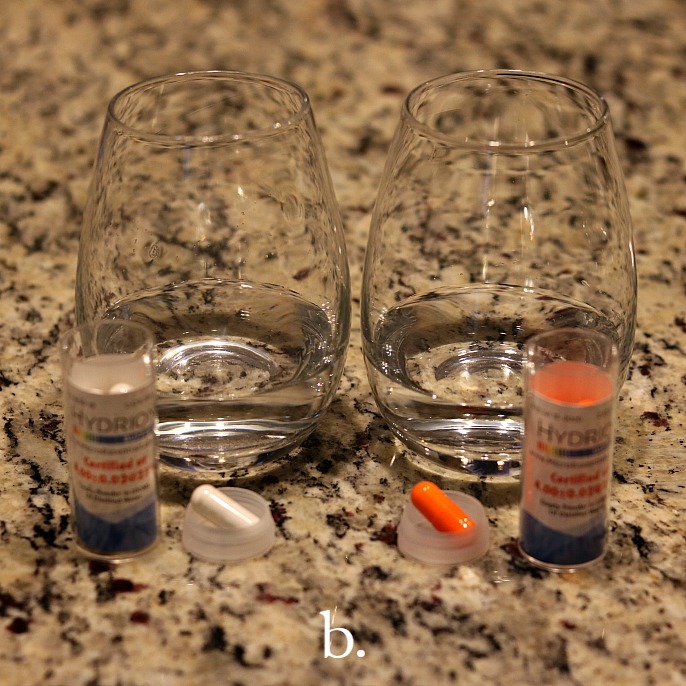 Prepare the buffer solutions: A) pour the pH 8.00 powder in a container and dissolve it in 100 ml of water at the room temperature; B) pour the pH 4.00 powder in another container and dissolve it in 100 ml of water at the room temperature (b and c). Calibrate the pH test meter: A) turn on the pH meter using the on/off switch; B) find the electrode on one end of the meter, submerge it in the pH 8.00 buffer while stirring gently, and then keep it still until a stable reading is reached; C) using the included screwdriver, turn the adjustment dial on the back of the meter until the LCD reads 8.00 (d and e); D) rinse the electrode thoroughly in distilled water before proceeding; E) repeat the above steps for the pH 4.00 solution, calibrating the meter until it reads 4.00. Remove the protective cap covering the electrode. Rinse the electrode with the distilled water. Turn on the pH meter by using on/off switch on the top of the unit. Immerse the electrode inside the brine to be tested. Stir gently and wait until the pH reading stabilizes. After use, turn off the pH meter, use the distilled water to rinse all areas in contact with the brine and replace the protective cap. You will need to calibrate your meter regularly in these three circumstances: a) if you plan to use the meter often, b) if you aim for accuracy, and c) if you haven’t used it recently. Therefore, I suggest you buy more buffer powder for storage. Last but not least, you should know that it is meaningless if you measure the pH without knowing the temperature the ferments are in, as temperatures can influence the readings of pH values. Generally speaking, higher temperatures tend to lower the pH values. To give you a reference for how you should calibrate and read the pH values of the ferments, I found a useful document which you could get access to by visiting http://bit.ly/pH-and-temperature-relationships. How to Use a pH Strip/the pH Paper? Tear off whatever amount of the pH test paper (a) you decide to use (if you use strips, take one strip from the pack). Use a spoon to take a little bit of the brine out of the ferments. Carefully drop one or two drops of the brine onto the one end of the strip (b) and wait for a few seconds (the color will change instantly). 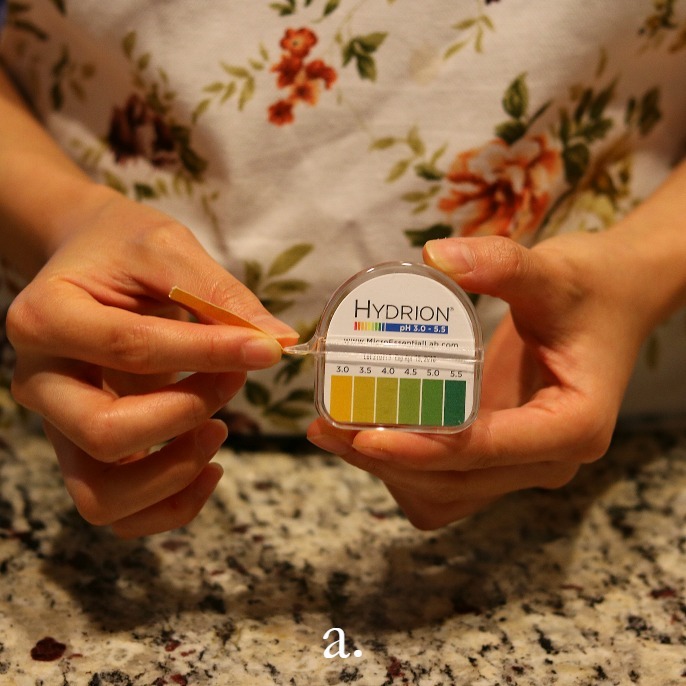 Quickly match the color against the color chart that comes with the strips or paper to obtain the pH (c). 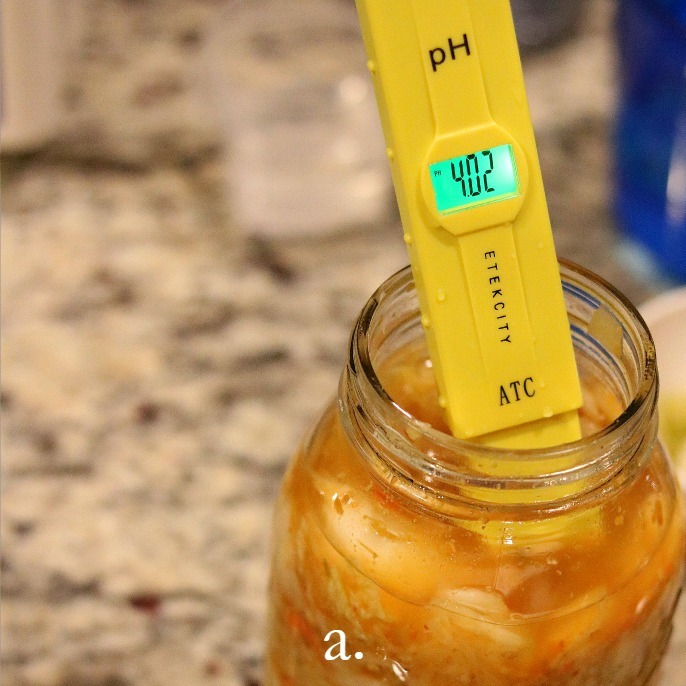 The downside of using strips or paper to test pHs of the different ferments is that the colors of the ferments can influence the reading of pHs. For example, the darker pigments of the brine from the red cabbage leaves can stain pH strips, which can distract you from getting an accurate pH. I bought 15-foot rolls of the test paper from Micro Essential Laboratory. The good thing about this is that you can control the length of the test paper you want to use.